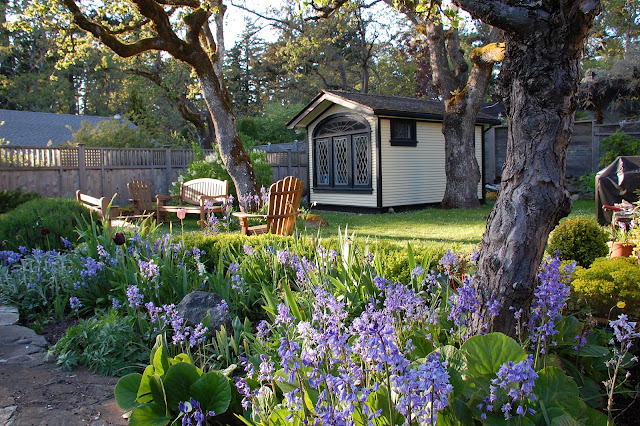 View of garden shed with bluebells as a foreground, in early May. Spring carpeting comes at a price: every flower sets seed. Welcome to the Seasoned Gardener, offering images from a westcoast bungalow garden and reflections on its seasons, days and moods. 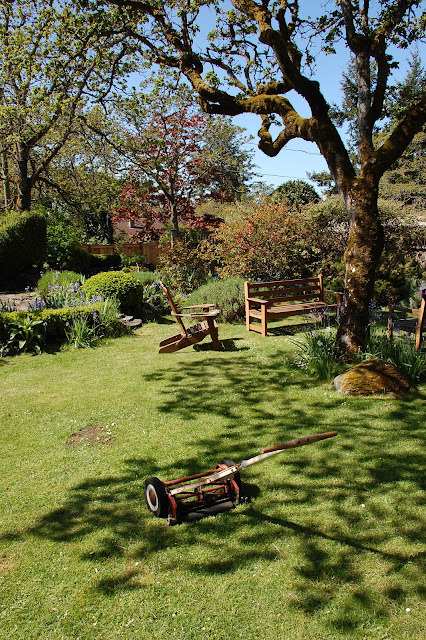 Seasoned Gardener refers to garden design that's apt for site and season, but also to the effects of time and insight on choices in the garden and, more ironically perhaps, on its gardener. Mostly I want to share some impressions of what's going on as the seasons here unfold, capturing some of the magic of the moment. I've been involved with gardens one way or another for most of my life, first as a simple maintainer, starting long before I had any inkling that there even were ideas and ways of thinking about gardens or gardening. My mother brought about the connection, conscripting me early on to help with outdoor chores on a largish corner lot. Hers was a simple perimeter garden with foundation plantings along the streetfaces of the house. There was a fair bit of lawn, several large, weedy Manitoba maples providing some shade in the back, and quite a few shrubs, including lilacs, plus a cherry tree, and a spindly apricot tree growing against a south wall, where it fruited readily. I remember that my mother always enjoyed being outside in her garden - it was a treat after dwelling in apartments to have outdoor space to enjoy, and she loved tending plants. Contrasty shadows reveal intense spring light, capable of bolting the garden into hyper-growth (the oaks are only partially leafed out at this point). It jumped from cool to 28 degrees in a blink! ﻿ Because I moved around the country quite a bit as a younger adult, I didn't set down roots or have the experience of caring for an ongoing garden for many years. Then, a quarter century ago next year, I chose to make Victoria, B.C. home and was lucky enough to find a heritage house on a characterful lot with a remnant Garry oak meadow. The combination of a house in a setting it was designed for seemed idylic to me. The moment I saw this house-in-a-landscape combination, my garden imagination was stirred by possibilities. I didn't know that what I was about to take on was a bungalow, nor that it once belonged to a local architect, nor that it was built in 1913 in a time of economic optimism that was about to abruptly end. I just loved the feeling of the place in its setting high on the rocks. This first posting comes as spring is going full tilt, when literally everything that grows is bursting with life around us. The Garry oaks were pretty much fully leafed out by the end of May, adding their green canopy to the scene. This is also a time of exploding floral display set off by a backdrop of spreading spring greenery. I've come to love this fleeting period when the greens are differentiated subtly into many gradations - it's a time when the eye is astonished by the way colours pop up against a lush green background. But this is also a time when things move along at a pace, picking up speed; and when we get stretches of heat and no rain, growth rapidly overruns boundaries and borders, and only ongoing interventions keep things from falling into early disarray. A fellow gardener and I were talking about the sense of panic that comes with all the emerging visual splendour - weeds, great opportunists that they are, grass, and shrubs all grow by the hour in these ideal conditions. Gardeners whose personal labour is the sole source of organized pushback are made weary chasing after rampant growth. 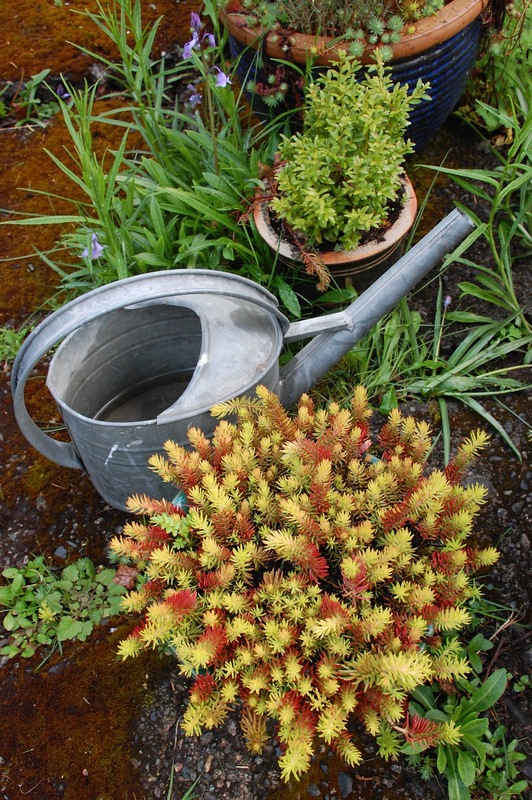 Lawns need cutting, shrubs need shaping, and weeds need pulling, at the same time that plants need feeding, soil conditioning, and if there's no rain, everything needs watering. Doesn't take much sunny weather to make the watering can a necessity. It's a rather cruel irony that the most exquisite period in the new garden cycle comes with impossible demands for labour and attention. It tends to make devoted gardeners slaves to their creations for a time - yet it's done willingly by fools like me. I remind myself it's important at times to simply enjoy being outside - taking time for tea on garden bench of an afternoon, wandering about witnessing floral incidents in the soft light of lengthening evenings, or following the robin's enthusiastic worm-hunting in moist grass at first light. Whether you garden or are just a garden watcher, spring is an exciting time because so much is happening and the tempo is accelerating. To a gardener, it reveals the outcome of planned changes and prior interventions. Spring also brings about a welcome renewal, as plants burst into blooms that gardens host and orchestrate as sequences. The eyes are fresh and ready to be entranced after the long dormancy of winter. With planning, luck, and a good watering can, the progression of blooms can last well into fall, and even, in the form of berries, endure into winter. 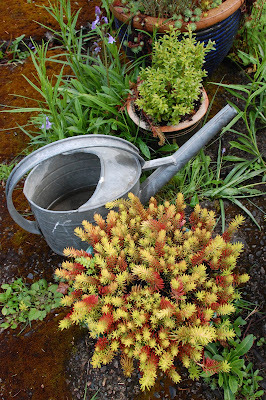 Westcoast spring often moves slowly, with grey rainy days that gardens love. 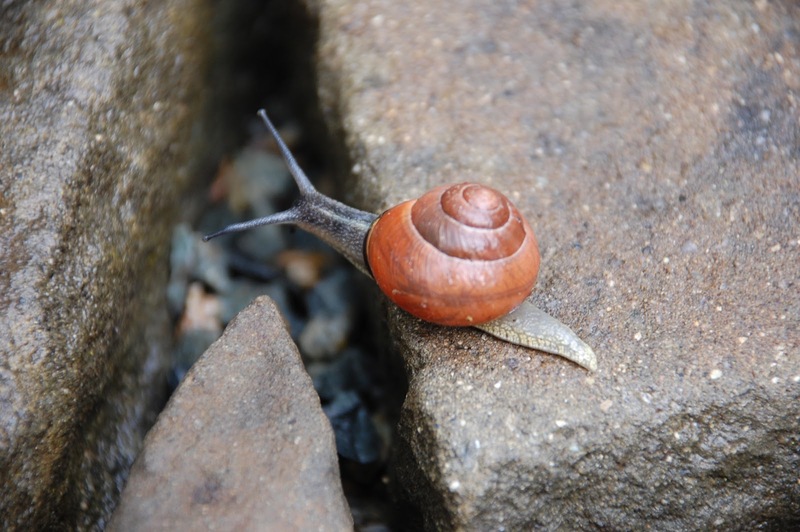 Snails like the moisture too. So this is a first post in what I hope will be a chronicle of events in a garden knitted between a landscape and a bungalow, which itself will celebrate 100 years of human habitation in 2013. The landscape is antique, dating at least to the last ice age when retreating glaciers left the rocky outcrops with grooves etched into smoothed surfaces. The oaks came much later, but have been there a long time too in human terms, despite being somewhat stunted by the dry, thin soils they subsist on. The gardener is, well, 'seasoned', if only in the sense of long experience, and always enjoys the return of spring. The spring garden is a culmination of many things - the changing progression of the weather, the stage of development, the choices made the previous year by both gardener and nature. After the austere dormancy of the garden in winter months, spring is a leap into movement that first ambles, then sprints and then at some point, turns into a luge ride. Then all we can do as gardeners is hold on, water as needed, and perhaps steer a little towards fall, when the pace again slows and things return to a state of repose. Alright then, it's back to work. It's just June and there are bluebells needing deadheading before they set their dastardly ample seed!